Working from home, I have the luxury of not being exposed to a lot of germs and other icky stuff that lead to the common cold and flu. Well, that is, of course, until Mr. Savvy comes home from the petri dish aka his office. Many of his coworkers have kids, which of course bring home all sorts of icky stuff and cold germs from schools that the parents then bring to the office. Just the other day Mr. Savvy was talking about one poor soul at his office that has been sick for next to forever and even wears a medical face mask to work because he keeps getting sick so much. Poor guy; I can’t even imagine. As a child, I was almost always constantly suffering from a cough, clogged sinuses and congestion, so I really hate getting sick. Luckily I don’t get sick too often these days and it’s a relief that this year I’m lucky enough to finally be able to afford health insurance. However, with as expensive as it still is these days to visit a doctor even with insurance, I try to do everything I can to prevent getting a cold or the flu, especially since when you’re self-employed, you don’t exactly have paid sick days. 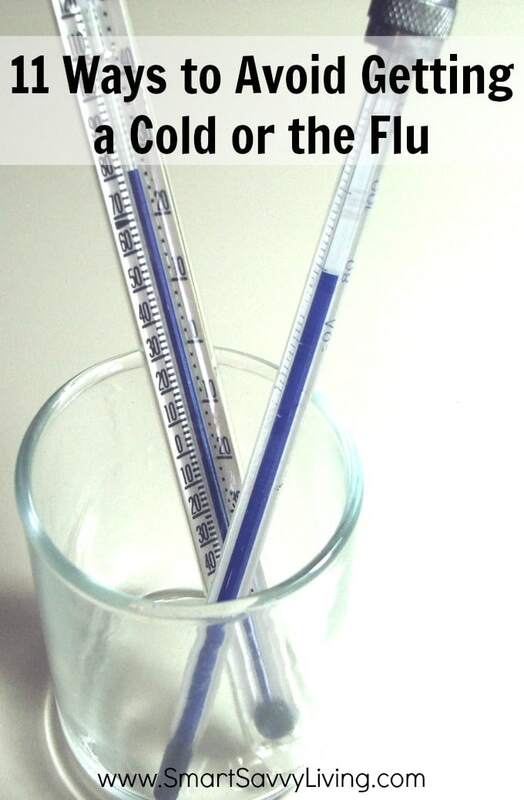 Here are 11 ways to avoid getting a cold or the flu that I’ve been using over the years. 1. Wash wash wash your hands, and other things you touch. Yes, this is advice we always hear, but I even still forget sometimes myself. Just about every time that I do get sick, it seems to be either from Mr. Savvy bringing something home or I go out to the store to shop, unpack and forget to wash my hands before eating. So, remember to wash your hands, preferably with soap, rubbing your hands for at least a minute or 2. Also wipe down things your family commonly uses and shares like all surfaces, appliances, phones, keyboards, etc. Regularly washing towels, sheets and other linens will also help. 2. Don’t touch your face, especially your mouth, nose and eyes. I am probably the world’s worst at not doing this. My eyes tend to water now and then so I commonly rub them. I often apply lip gloss. Plus, I often rub my face when I’m thinking. Unfortunately, touching your face is a super easy way to transfer germs from your fingers and hands to easily infected areas of your body like your eyes, nose and mouth. 3. Make sure you’re sleeping enough. I am a self-proclaimed night owl that has no problem staying up until 1 or 2 or sometimes even later in the morning. Luckily, my schedule is pretty flexible, so I can sleep in a bit. But, if you have to get up early, try to get at least 6 – 8 hours of sleep a night to keep your immune system in the best shape. 4. Eat healthy foods. I know, I know, you’re probably saying, “Well, duh, Michelle!” but I think we all need a reminder to eat healthy foods now and then. In this go go go world, it’s easy to depend on less-than-healthy pre-made foods, but don’t forget to eat some salads, fruits, broth and other veggies to stay healthy and get your vitamins. When I know my eating habits aren’t the best, I do like to take a multi-vitamin, especially during the winter, just in case. 5. Stay away from those that are sick. I know it seems like a no brainer, but as a woman knowing someone is sick gets my caregiver tendencies tingling. It’s always a nice gesture and heartwarming act to help out a sick friend or family member, but honestly, I’ve always gotten sick myself. Before Mr. Savvy and I moved in together I tried being the sweet nurse to help him feel better, but yet, a few days later I was feeling icky myself. 6. Just say no to buffets and shared foods. I love a good Chinese buffet and digging into that delicious-looking dip at a party is where I always head to first. However, if you really want to stay cold and flu free, you may want to stay away from these shared foods. You never know how many people have touched the dishes, or if little kids may have sneezed in the food (I know, I’m gagging with you) and have spread their sickly germs all about. 7. Be careful what you touch. When you’re out in public or even over at a friends house, be careful what you touch. Think about how many people have touched that grocery cart or even the products in the store. Ick. Of course, you do have to go shopping at some point, but remember to wash your hands when you’re done and don’t be afraid to wipe down the cart handle and use anti-bacterial lotions. 8. Avoid sharing items with sick family members. Especially if you have kids, someone getting sick in your household is inevitably going to happen. When they do, avoid sharing common items like beverages in bottles, phones, toothpaste, shampoo, soap, pillows, towels and thermometers. 9. Go easy on the stress. As a fellow worry wart, I know it’s easier said than done to not worry and stress yourself out. Crap happens sometimes, but be proactive about cutting stress out of your life. We hear almost every day about studies that say how stress can play a big part in our health. Stay away from the drama queens and stay active so you don’t find the time to stress about everything. I also like taking a few minutes to meditate or do a breathing exercise to help ease my worry wartness. 10. Use essential oils. Did you know that many essential oils actually have antibacterial properties? Regularly diffusing essential oils or even using them in homemade air fresheners or when washing your laundry to help keep your clothing and linens super clean. 11. Be proactive if you feel like you’re getting sick. Do you ever crawl into bed after a long day and realize that you feel like you’re starting to get sick? You know, the sniffles, bit of coughing, having to clear your throat, feeling extra tired feeling? Sometimes your body can fight off the illness before it breaks out into a full-forced cold if you take extra care of yourself. Get some extra sleep for a few days, stay super hydrated, eat plenty of vegetables and other healthy foods, skip a few workouts, and overall just take it easy to allow your immune system to do its thing to stay in tip top shape. Bonus: Get the flu vaccine sooner than later. I didn’t include this in my 11 because I know that not everyone has access to the vaccine and some are against getting it, but it can help prevent you from getting certain strains of the flu.